So, most members should be aware by now that the old 40m dipole has been removed and replaced with a new 40m dipole! The feedpoint 1:1 balun was also changed for good measure and sealed thoroughly for the winter. Activity 1 will add elements for 30m and 20m expanding the 40m dipole into three parallel dipoles. This will result in a tri-band antenna that is resonant on 40m, 30m and 20m giving us a very useful antenna. Activity 2 will replace the coaxial feeder between the radio room and the antenna feedpoint. Today we have approximately 2.3dB of loss at 7.1MHz between the radio room and the antenna feedpoint. Assuming the coax is in the very best condition (which its not) and it’s RG-58C (Its an RG58 of some sort) this equates to about 54m of coax. That’s a 40% power loss on Tx and Rx. Replacing this with RG-213 reduces the loss to 0.9dB or a 19% power loss. An improvement of 1.4dB or 20% doesn’t sound much and its not but consider the situation at 14MHz. With RG-58C there is 3.2dB / 53% loss but using RG213 the loss is 1.3dB or 26%. To put this differently. The transmitter places 100W max into the feeder at 7MHz, 10MHz and 14MHz. With RG-58 the antenna receives: 60W, 54W & 47W respectively. Replacing with RG-213 results in: 81W, 77W & 74W. Using a better coax and one that does not cost much more than RG-213 the situation can be improved further. The overall difference of using something like Ultraflex-10 over RG-58 is definitely worth having and that is why activity 2 is so important. The completed parallel dipole antenna will remain in its current location supported by the trees at either end. But supporting the end of the antenna elements will require two attachment points instead of the one we have today. Investigation has showed this is not a significant obstacle. 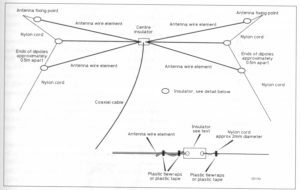 Thanks to Peter, G3LDO for the above diagram taken from his excellent book Backyard Antennas. This entry was posted in News and tagged Antenna, Dipole, G0RVM, TSGARC by Andrew G0RVM. Bookmark the permalink. Absolutely Andrew. 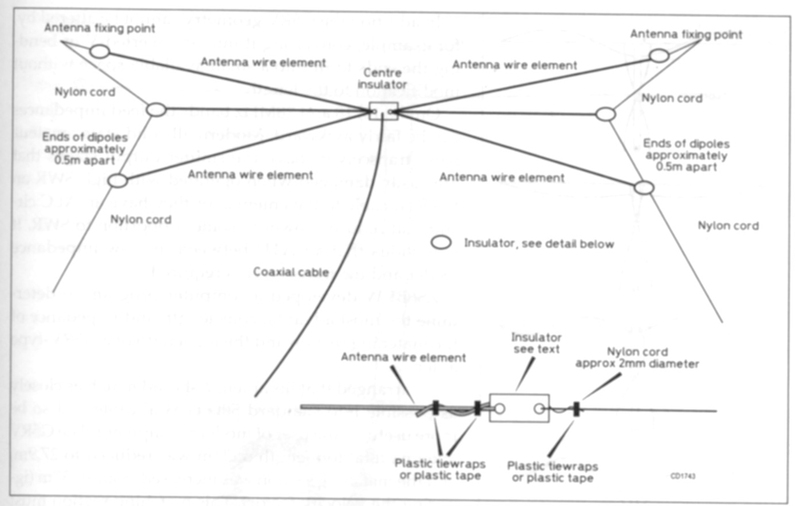 Count me in on the next phases of the antenna build.